This was one of many photographs shot on a trip taken in the autumn on the West Somerset Steam Railway. Minehead is at the end of the line and was a pleasant place for a walk with the camera. The town has its origins as far back as the Bronze and Iron Ages. At the beginning of the Second Millennium, it was held by Aelfgar, Earl of Mercia, before falling to the Normans after the 1066 conquest. 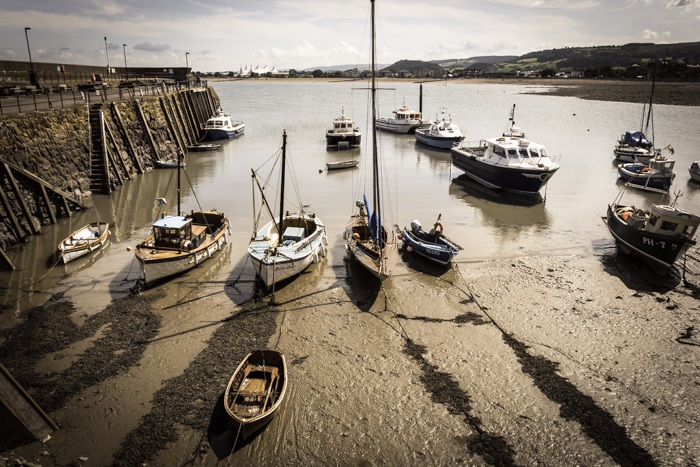 A port is recorded in Minehead in the 14th century, and it was a busy trading centre in the medieval era. It lost this use in the 20th century, as larger and deeper ports were needed, though some maritime leisure trade persisted. It is now largely a holiday destination and retirement place. As regards the photograph itself: I have used a wide-angle setting – 18mm – to capture the breadth of the dock area and to create a sense of exaggerated perspective, which is already marked by the converging lines of dark seaweed and I think is one of the main appeals of the scene. For the same reason, I have desaturated the colours and introduced vignetting, to amplify the contrast between the edges and centre, to create a greater sense of depth.